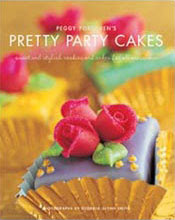 Last week I went to the library and found the book Pretty Party Cakes by Peggy Porschen. I'd never heard of her before but i'm so glad I do now! I really really really want this book badly and you know, i'm so lucky, because it's my birthday next month, I don't think i'll have to wait too long - yay!!! 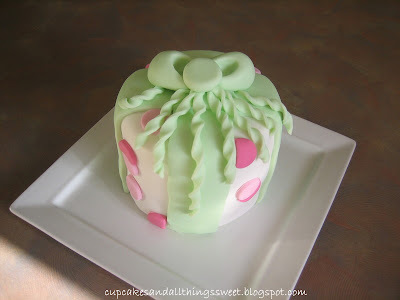 Anyways, in the book their is a square present cake and that cake looked fantastic with a green ribbon and light and dark pink circles. I loved it so much that I made a similar smaller one for a family gathering. It was so funny when I lifted the cake out of the bag, there were a few Whaaaays and cheers going on! My improvised bow. I made the bow in the book but hadn't let it dry long enough so when I attached it it completely caved in! Not sure about those curly ribbons though (another improvised idea of mine). 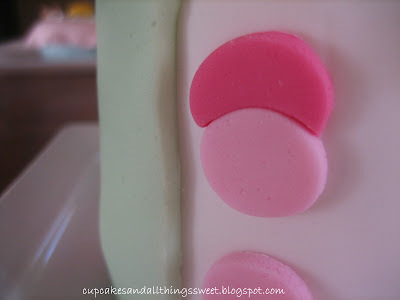 Tomorrow i'll post up the other cake I made! Yup, I made two small cakes for the gathering and tomorrows cake is my favourite. Those cakes are beyond cute. They're beyond precious. All I can do is coo. And the question is, what type of pie for breakfast? Hi there just thought I would let you know I found your article on bloglines and you might be interested to know that Peggy Porschen has announced some new masterclasses - coming soon. We have published the details of the masterclasses this week. 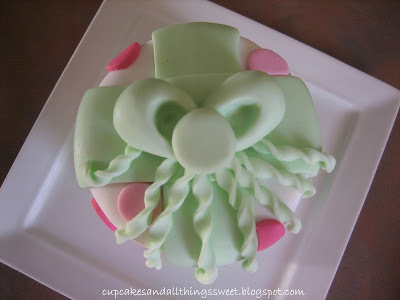 These have to be some of the cutest cupcake ideas I have ever seen. I would love to feature them on my blog Cupcake Ideas For You check out the site then let me know if you would like to be a guest blogger. Thanks!